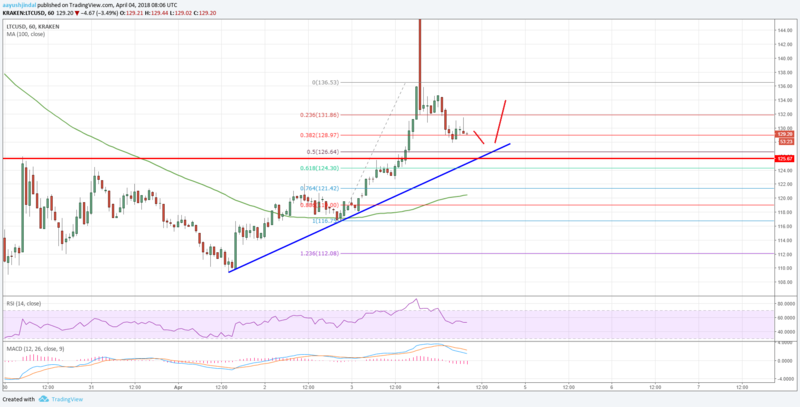 Litecoin price gained bullish momentum and traded above $125 against the US Dollar. LTC/USD is currently correcting lower and it remains supported on the downside. Litecoin price is positioned nicely above the $120 and $125 supports (Data feed of Kraken) against the US Dollar. Yesterday’s highlighted major bullish trend line with current support at $125 is intact on the hourly chart of the LTC/USD pair. The pair is currently correcting lower, but it may soon find support near the $125 level. There was a decent start of an upside move from the $115 swing low in litecoin price against the US dollar. The LTC/USD pair traded higher and succeeded in breaking a few important resistances such as $120. The most important upside break was above the $125 level and the price even traded above $130. A swing high was formed at $136.53 from where the price started a downside correction. It has moved below the 23.6% Fib retracement level of the last wave from the $116 low to $136 high. However, there are many supports on the downside around the $125 level. The mentioned $125 level was a resistance earlier, and now it will most likely act as a support. Moreover, yesterday’s highlighted major bullish trend line with current support at $125 is intact on the hourly chart of the LTC/USD pair. The trend line support is near the 50% Fib retracement level of the last wave from the $116 low to $136 high. Therefore, the $125 support will most likely serve as a major support if the price moves down further. Below $125, the next crucial support is near the $120 level and the 100 hourly simple moving average. On the upside, the pair faces a short-term hurdle near the $135 level. A push above the stated $135 level could open the doors for a run towards the $150 level in the near term. The overall price structure is positive above the $125 support level.